In the mid-19th Century, Dutch settlers went to East Prussia (now part of Russia and Poland) near the town of Tilsit. Away from their familiar homeland and with inadequate supply lines to deliver their native cheeses, these settlers craved the Gouda they had come to love. Through their determination and their passion for fine cheese, they resolved to attempt a recreation of their beloved Gouda. Unfortunately for them, but luckily for us, one cannot make Dutch Gouda in a damp, moldy Prussian cellar. During their efforts to recreate Gouda, the cheese, aging in a damp cellar, became infected with molds, yeasts, and bacteria. Thus Tilsit was born. The settlers named the cheese after the Prussian town of Tilsit where they settled. It is sometimes called “Tilsiter”. The Swiss love cheese and it didn’t take long for them to co-opt Tilsit where it has been manufactured since 1893. Swiss Tilsit is produced in 3 varieties: A mild version (green label) is made from pasteurized milk. There’s a more strongly flavored one, made from fresh, unpasteurized milk (red label). It’s usually called “Farmhouse Tilsit” and is enjoyed by many who enjoy a more intense cheese. 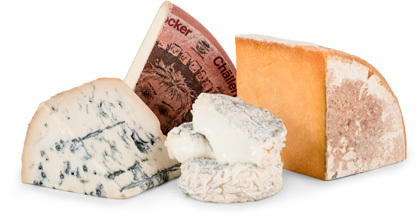 It’s aged for about five months, a process which yields a strong-smelling cheese similar to Limburger in aroma. Farmhouse Tilsit is a much sought after version of Tilsit but has the disadvantage of being less versatile than its milder cousin, which is used in a wide variety of recipes. The third version of Tilsit is produced from pasteurized milk with added cream and sports a yellow-label. Similar to Havarti, Tilsit has a fuller and more intense flavor than Havarti. 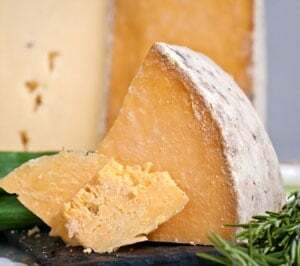 With a brownish-orange washed rind and made of partially skimmed milk, this exquisite cheese has a rich yellow color with a springy elastic semi-firm texture, making it ideal for slicing. Tilsit also has a piquant flavor, lending itself nicely as a table cheese. A rare luxury in the United States, Tilsit is a fragrant, surface-ripened cheese that is sure to satisfy. Note this cheese's lovely buttery yellow color and tiny elliptical holes. We found the consistency to be springy and elastic, yet rather moist and creamy. Look for a mild flavor that's delicate with spicy undertones. A handy cheese to have at your disposal, Tilsit can be cubed for use in salads, heated for addition to sauces, melted over potatoes, flans, or on burgers. Often flavored with caraway seed and peppercorns, Tilsit is a complement to hearty brown/rye breads and dark beers. Tilsit is similar to, but has a much fuller flavor than, Havarti. Think of it as Havarti with a flavor boost and aroma to match!